You can minimize to tray such well-known applications as Outlook, Outlook Express, Internet Explorer, Firefox, Chrome, Thunderbird, Sunbird and others. Additional title bar buttons: Minimize to tray, Roll up/down, Stay on top and Make transparent. These buttons are customizable - you can set up their order or turn off any of them. Additional items into a taskbar pop up menu, which can be activated by right click on the taskbar button (Shift + right click under Windows 7). 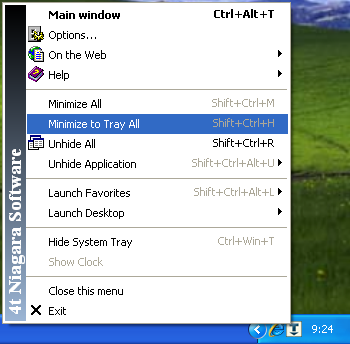 4t Tray Minimizer can hide the system tray icons to let you easily read the buttons on your taskbar. To make the system tray reappear, simply place the mouse cursor at the edge of the task bar, where the system tray is hidden. With pop up menu or hot keys you can easy Minimize to tray all applications, Restore all application, launch a shortcut on your Desktop, etc. You can roll up any window to its title bar. You can make semi-transparent any window to take a look at background windows.